The Portuguese City of Mazagan (El Jadida) is a port city on the Atlantic coast which was seized in 1502 and subsequently ruled by the Portuguese until 1769. It has been acknowledged for its interchange of influences between European and Moroccan cultures. The Portuguese built a citadel here in 1514, and enlarged it into a fortification in 1541. They also constructed 4 churches within the fortification. Remaining buildings from the Portuguese period are the cistern, and the Manueline Church of the Assumption. After the departure of the Portuguese, the city remained uninhabited until the mid-19th century. I visited this WHS in April 2018. Just as Essaouira was formerly known as Mogador, El Jadida was known as Mazagan. Both fortified towns are along the Atlantic coast and both have their own charm even though El Jadida is definitely smaller and lacks the medina atmosphere. Apart from wandering in the few streets with bilingual names and alphabets in Portuguese and Arabic, the only three things to do here are walking on the fortified walls with a very picturesque view (photo - best time is in the morning), visiting the underground cistern and visiting the Manueline Church of the Assumption. 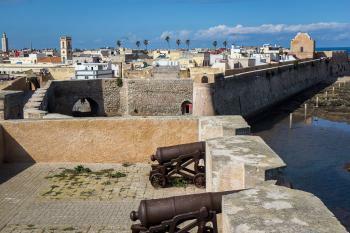 El Jadida in a way is quite similar to the Three Cities or Mdina in Malta and the Cittadella in Victoria/Rabat, Gozo. Next to the entrance gate is a tower-like monument with the UNESCO WHS inscription plaque. As a little trivia, the UNESCO symbol on the plaque is upside down! All in all El Jadida is a worthwhile half day trip from Rabat and you can easily stop half way to take in Casablanca too. La Capitainerie is a hidden gem of a restaurant within a former church/chapel and their hummus, calamari dish and/or seafood tajine alone are worth the visit! This old Portuguese fortified town is quite small and it doesn't take too long to walk through it and get a sense of the place. It's quite interesting in the way it was designed and the historical significance in indisputable. There are some nice views from the walls but, other than that, there's not a whole lot to see. There were not many visitors at all when I came and I guess it's not the most popular place in the country. In fact, I didn't bother staying the night here and got the train up to Rabat afterwards (although that did get me in quite late). I travelled to El Jadida by train from Casablanca-Voyageurs, then took a petit taxi to visit the Portuguese city. This was very compact area contained within walls and bastions. The connections to Portugal were limited however to an underground cistern and the Church of the Assumption. The portuguese city is old that's why it's in ruins. El Jadida is full of really great people both in 2001 and 2004 when I went. Everywhere life is bustling and everyone is ready to roll out the red carpet for visitors. The beach Sidi Bouzid is beautiful and worthy of its fame. El Jadida is more than just the Old City. The cafes are quaint and the food is good. Now that it's been so built-up it's well worth a stop. 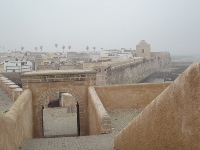 Essaouira was freezing in September due to the wind. El Jadida was and will be my favorite and if you're looking for the real Morocco, not shopping centers in Casa or touristy games in Marrakech then I recommend El Jadida. Nothing has changed in El-Jadida recently. I was in January 2009 and the conditions in old medina are appaling. Litter everwhere, old Portugese churches are closed, many houses are ruined, mosques are closed for non-muslims as usual. Despite that it is worth visiting - walls are strong and well preserved, Portugese cistern is a "must" to see and really interesting. The most impressing view of Mazagan is from the pier in fishing port, especially in the early morning of sunshine day - recommended. 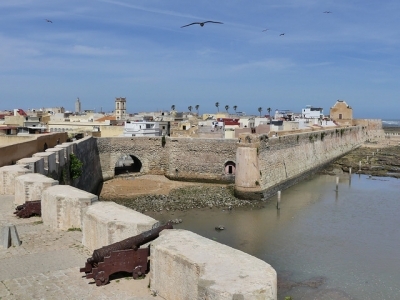 Lors d'une recente session de la marie d'El Jadida, ville marocaine qui abrite les fortifications portugaises dites Mazagan, il a été decidé de construire une série de magasins juste en face de la cité portugaise Mazagan, qui vient d'être classé comme vous le savez, patrimoine universel le 30 juin 2004. Cette série de magasins qu'on estime à une centaine, en plus de quelques petites gargottes et un hôtel,sont prévus dans la zone non constructible autour des fortifications, zone ayant été dégagée suite à la démolition de tout un quartier, pour répondre justement au cahier de charge, tel que exigé par l'ICOMOS. 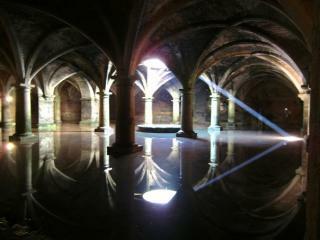 I was in El Jadida in August 2004. The old city is crumbling, the town has a very dark side to it - quite unlike Essaouira, which is very charming and well preserved - and theres litter and neglect everywhere. I was very appaled to see that.